Dutee Chand joined hands with his superb companions, P T Usha, in the list of athletes who have won more than one medal in Asian Games 2018 because they got a silver pair in their kitty after reaching the second place in women's 100 meter dash here today. Dutee Chand crossed the finishing line in 22.20 seconds behind Bahrain's Edidong Odiong, who won gold in 22.96. Bronze went to China's Wei Yongli (23.27). 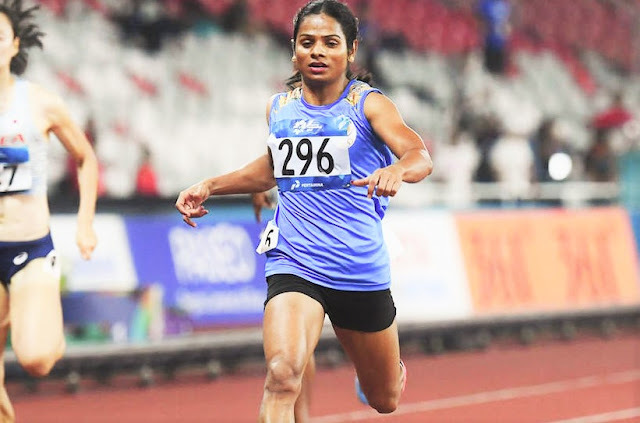 This 22-year-old Odisha runner has been an excellent performer, which was not allowed to compete under the IAAF hyperandogenism policy in 2014-15 due to which Dutee Chand missed the 2014 Commonwealth and Asian Games. Dutee fought a case against the policy and won in the mediated court for the game. In the recent amendment of the IAAF's hypersensitivity policy, Dutee Chand has been excluded from its authority. The legendary Usha won four gold medals in the 1986 Seoul Asian Games, in which she won 200 meters, 400 meters, 400 meters hurdles and 4x400 meters relay. Jyotirmoi Sikdar, (800 meters 1500 meters) won two medals in the 1998 Bangkok Games.